About an hour north of Suncadia is Leavenworth, a charming Bavarian Village known for delightful specialty shops, numerous choices for cozy accommodations, and an active calendar offering a year-round schedule of festivals, music and live theater. The quaint, Bavarian theme is very at home against the breathtaking backdrop of the steep, snowy Cascade Mountains soaring 8000 thousand feet above. 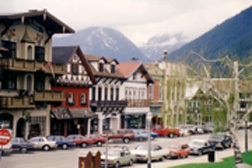 The sight of locals in lederhosen and the sounds of polka make Leavenworth a must-see day trip.